Operatives of Federal Special Anti-Robbery Squad of the Imo State Police Command have apprehended a suspected notorious kidnapper and armed robber, Godwin Onyebuchi, also known as Papa G, in his hideout in a polytechnic hostel in Owerri, the state capital. The alleged serial killer's arrest reportedly made residents of Owerri to jubilate, including police officers who gathered to have a glimpse of him, as the suspect, who had escaped arrests, had been on the wanted list of the police for a long time. A police source disclosed that Onyebuchi was nabbed on Saturday at Solo Lodge hostel located around Federal Polytechnic, Nekede, which had served as his hiding place after deadly operations. The source said; “In order to beat police investigation, he uses that hostel as a hiding place after deadly operations. He pretends to be a student. He knew police were tracking him. 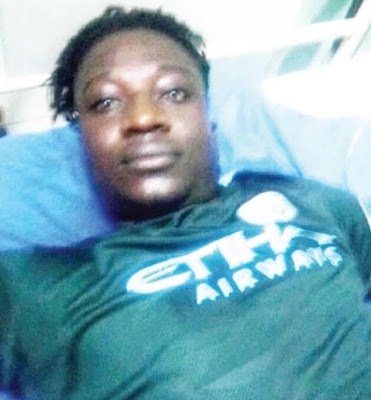 It was gathered by Southern City News that the suspect was responsible for the kidnapping of a popular gospel singer, Chinedu Nwadike, and one Rev. Columba Okereke in August 2017. “In August, 2017, a gang of armed robbers and kidnappers led by Godwin Onyebuchi, who operates between Imo and Abia states, abducted a popular gospel singer, Chinedu Nwadike, and Rev. Columba Okereke. “Acting on intelligence, the operatives of Federal Special Anti Robbery Squad of the Imo State Police Command, led by their commander, SP Victor Godfrey, swooped on him at his hideout, Solo Lodge hostel, Nekede, on Saturday and arrested him. On sighting the F-SARS operatives, he jumped down from the three-storey building and broke one of his legs,” the source further disclosed. It was gathered further that the suspect was rushed to police clinic, Amakaohia, Owerri, where he was receiving medical attention. The two kidnap victims and the suspect’s gang members in the police detention had identified him as the ring leader. Confirming the arrest, the State Commissioner of Police, Chris Ezike, said a robust onslaught against criminals and their hideout was ongoing in the state. “The suspect has been on the wanted list of the command. Acting on intelligence, we have to arrest him. He will be ready to answer for all his atrocities. As a command, we will continue to ensure that Imo people enjoy their sleeps,” the state CP said.